Charming Cape Cottage in Brewster-Cancellation 7/20-27! Discover our fully renovated, charming vacation cottage located in the heart of the historic village of Brewster. There is a fully equipped kitchen, living room, bedroom with queen bed and full bath. Living room has a sofa that opens to a queen bed and there is a gas grill and picnic area. We are tucked away on a quiet lane, but you can easily walk to shops, restaurants, food markets and beautiful bay beaches. We are also right on the bike trail where you can ride from Dennis to Wellfleet with stops in Nickerson State Park, ponds and ocean beaches. Enjoy the relaxing ambiance of Old Cape Cod with the conveniences of today. A/C available and our cottage is heated for off season use. This cottage is one of 3 similar vacation cottages on the property. Please contact us for availability. Nightly rates available during the off season. Occupancies starting July 1, 2019 are subject to the new MA Lodging Tax of about 14%. The amount is still being determined for the Town of Brewster. Payment options-Credit card or e-checks. There is no charge for e-checks. There is a $50.00 fee for air conditioning and a $30.00 fee for linens. Cancellation policy: Refund only if the cottage is re-rented. We usually are able to re-rent the cottage with at least a 2 week notice, especially for the in-season weeks. A $50.00 service fee will be charged. Last minute emergency cancellations will be discussed individually. There are so many great beaches to choose from very close to the cottage! Enjoy the quiet bay side with sandy shores and calm warm waters. The waves of stunning Nauset Beach are just a few miles away. Feast on the best local seafood! Enjoy great local seafood and other coastal style dining favorites at fabulous restaurants very close to the cottage. Evelyn & John have been year-round Cape Codders since 1979. Evelyn in a full-time Realtor with Kinlin Grover Real Estate in Brewster. John enjoyed a long career with the United States Postal Service. He now applies his incredible maintenance skills toward keeping the cottages in tip-top shape. We love the Cape and invite you to experience the beauty of Cape Cod in a comfortable, relaxed way. Very clean and comfortable cottage. Great location within walking distance to shops and restaurants and the beach. We are also right on the famous Cape Cod Rail Trail. Easy access to all points on Cape Cod. Tucked away yet close to everything! We are just seven tenths of a mile from beautiful Cape Cod bay beaches. Sunbathe, swim, stroll for shells and beach glass, watch the fabulous sunsets. Looking for action? Hyannis is just 15 miles away with lots of shopping, the Cape Cod Mall, movies, restaurants and nightlife. Spectacular Nauset Beach on the ocean side is close by in Orleans. The setting is quiet and private. Walk to the quaint village of Brewster for great shops, restaurants, food markets, art and antiques shops, historic Captain's homes and more. Great freshwater swimming, boating and fishing can be found very close by. There is Flax and Cliff Pond in Nickerson State Park, pristine Sheep Pond for swimming and fishing, and boating at Long Pond. Available for an additional $50.00 per week. The cottage is heated for off season use. Each cottage has a private picnic area and gas grill. A quiet spot to catch up on your reading! Bike rentals available very close to the cottages. We are right on the famous Cape Cod Rail Trail. All types of boat rentals and fishing trips available close by the cottage. 1 queen bed, 1 queen sleeper sofa, extra cot available. Linens (sheets, towels in 3 sizes, bath mat, dish towels, ) available by request at $30.00. A/C available for additional $50.00 per week. Cozy home in a great location. We enjoyed our stay at this charming home in Brewster. We’ve stayed at the Cape every year for the last five years and this is the first time we’ve had to pay extra for towels. Maybe that’s becoming standard for the area. Let’s hope not. Anyway we enjoyed our stay and they deserve the five stars. Thank you for the great review. We try to keep our rates very low and give guests the option of bringing their own linens. Many do not mind doing this if they are driving to the Cape. Unfortunately, providing linens is a lot of work, especially since we do not have a washer and dryer on the premises. Sorry. We hope to see you again in 2019! This is a nice place for a visit to Cape Cod. Easy to get to beaches and the many towns on the Cape. A little musty, but easily aired out. While we did not use the kitchen, I was nicely appointed, and there was a grill. The owners respond very quickly to questions. Felt very private. 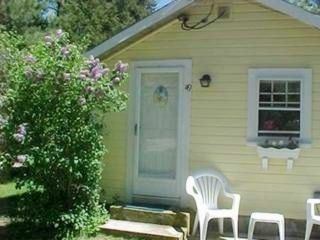 Adorable cottage, well kept by very attentive owner. This is an older property that maintains the New England charm of another era. Perfect for the two of us (although it will sleep 4 with pull out bed). Our main objective on our trip to the cape was riding our bikes on the well maintained trails. When I reached out to Evelyn during booking process to inquiry how close to the Cape Cod Rail Trail the cottage is, Evelyn responded immediately, 700 feet. She wasn't kidding!!! Go out the front door, turn left and there you are, on the trail. The cottage location is near Route 6A but the property is very quite. Evelyn is a joy to work with and responded very quickly to messages placed through the VRBO website. We met her during our stay and she was very knowledgeable on the places to go and things to do while visiting. She gave us excellent suggestions on where to eat on the Cape (and knew the places that were closed for the season).I would not hesitate to book this property again on our next visit to The Cape! Very clean and well cared for. The back room off the bathroom was a little musty. Thank you for your review and thanks for letting us know. We did indeed find a water leak in the storage room. We will get that repaired asap! This was a charming little cottage and a perfect location for exploring the sights around Cape Cod. Brewster is a charming town with lots to do if you like walking/biking/hiking and it is a short drive from the many beaches. The cottage was spotless and clean, and had all the amenities we needed. It is older and therefore does have the odor of an older camp. Opening windows took care of the majority of this. Evelyn and John were lovely hosts. With all the rain we've had, it has been hard to keep dampness and humidity out of our cottages and homes on the Cape. The fall is usually much dryer and the cottage usually does not have this issue. We stayed in Cottage #49 in Brewster, and it was perfect for us to enjoy a few relaxing days on the Cape. It is centrally located, a perfect spot to base your vacation. The cottage has everything you could want, outdoor grill, kitchen if you want to do your own cooking, and a quiet and pleasant atmosphere. Explore the different bay beaches, ride (or walk) the bike trail, go for a swim at Sheep or Flax Pond, go antiquing, see a play, read a good book, visit the Brewster General Store, visit the Cape Cod Museum of Natural History and hike the John Wing Trail to the beach, walk to the beach for the sunset, spend a day at Nauset Beach, spend a day in Provincetown and go on a whale watch, visit the Audubon, explore Chatham and go to the band concert on Friday night, dance to music at the Woodshed, have an elegant dinner at the Bramble Inn, have a lobster dinner, go to the free concert at the Drummer Boy Park in Brewster on Sunday night, go to Christmas Tree Shop, go fishing, relax and do nothing, go to the Wellfleet Drive-in Theatre, Go to a Cape league baseball game, enjoy a round of golf at the Captains Course in Brewster, take a drive through the National Seashore in Wellfleet, stop in at the Wellfleet Beachcomber for refreshments, tour the art galleries, or just lay on the beach. Other Activities: Art galleries, excellent restaurants, National Seashore beaches, many historic sites. Write or call for great off-season rates. During the off-season we can accommodate a stay of 3 nights or more. $100.00 security deposit required for all rentals. Returned promptly if there is not damage and the cottage is left reasonably clean.